It's hotter than the deep south here in Arlington today... 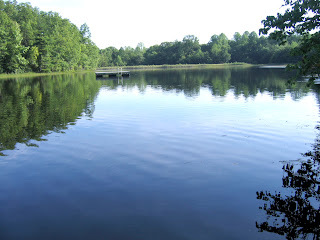 Here's a shot of the reservoir at Shakerag - yes these clean cool waters was a mere 5 minute walk from my studio and 8 minute walk from my room. By the looks of the people who live close by and swim often, I think it's the fountain of youth. A quick dip and swim to the end and back was welcomed treat anytime of day. I'm not sure I've ever swam through lily pads before. Since I've been back I've been in search of water to swim, no such luck... still looking, I found a pool - no lily pads. The other thing I really miss from the last two weeks was having studio space outside my house. Pure heaven - while we were all packed into a tight space, we were happy to be there. 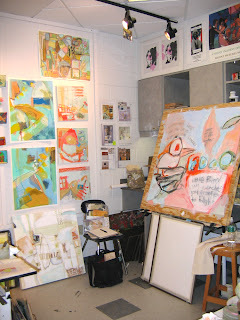 Here's a shot of my paintings in progress the second week - as you can see I've taken over the whole corner and counter. It's nice to walk into a space with nothing but works in progress, ideas, lack of, and materials. And of course sharing it with 15 other inspired artists around the clock was an added bonus. A room full of energy. It was especially interesting to see how we all took off in different directions given the same initial suggestions. Even the pieces I produced seemed diverse in their approach and outcome. I love that. 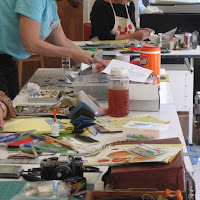 This was a great place and time to take risks and experiment with new ideas and materials. Who knew I'd find a slice of heaven tucked away in Tennessee? This was my second visit to the volunteer state. Last year I attended an artist residency at Arrowmont in Gatlinburg (right outside of Dollywood) and this year was a 2 week stay at Shakerag. It's a new artist residency program and it's unbelievably organized, well run and attended. It's a gorgeous intimate campus tucked in the mountains, and sprinkled with cutting edge sculptures. I can't say enough good things about it, it's the perfect setting for an art think tank. I was fortunate to have the opportunity to study with both Dolph Smith (me pictured with him) and Andy Saftel (he pictured with his hard working painting palette, giving a demo on plaster). Two masters in their field. 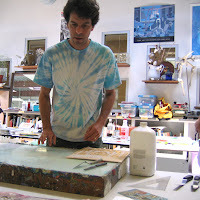 Dolph is known for his book sculptures and Andy for is layered narrative paintings and sculptures. What a treat to have a week with each of these talented artists. I've been looking forward to this for almost a year. I spent about 9-12 hours a day in the studio picking up every morsel of wisdom I could from these two. Each class had about 16 talented students, ready to jump in like myself. It amazing how motivated I can be when in an atmosphere surrounded by fellow artists and my art supplies, a studio, no cooking, no to do list, and no distractions (other than for a dip in the local reservoir). If only I could keep up this prolific pace at home... I made 2.5 books and started 11 paintings. WHEW! The other fantastic aspect of working with Dolph and Andy is that in addition to sharing technical techniques they are both willing to share their process for creating and their journey as an artist. I think their insights on these aspects are more helpful when I'm home in my studio and making a go at it alone. 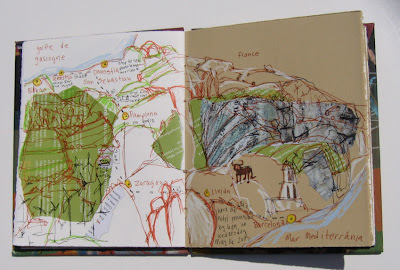 Here's a sketchbook entry from our drive from Barcelona to Bilbao. Since we underestimated the drive (by 4 hours) I had plenty of time to work on it in the car... Plenty. Page includes a map (which proved to be worthless, so I was happy to rip it up) and brochure collaged in, pen and colored pencil. I love this page - very layered, unplanned, loose, and busy. A nice visual feast in my sketchbook. 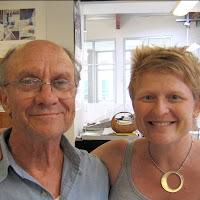 I'm off on another adventure today - headed to Shakerag to study book making with Dolph Smith and painting with Andy Saftel. Shakerag is located in Tennessee near the Sewanee river (really, it is) - hopefully close to the smokey mountains so it's not so sticky... My bags are packed - I have more art supplies than clothes in my bag... and hopefully when I return there will be more art and less supplies.